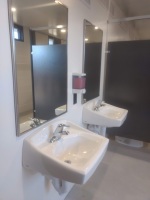 The east restrooms at the Cloud County Fairgrounds got a facelift after 30 years of fairs and activities. Project funds came in the form of grants from Dane G. Hansen Foundation, Charles H. and Isabell Blosser Foundation and the Meridian Way Wind Farm and a donation from the Concordia FFA Chapter. The Kansas Crossroads Resource Conservation and Development Area Incorporated assisted the board with grant and administrative guidance. 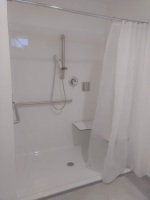 Cary J. Stupka Construction was the general contractor. He discovered our ongoing plumbing issues were below the concrete floor, and they would never have gotten fixed had we not had to demo the floor. 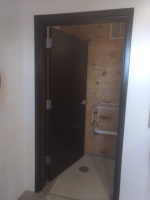 Both restrooms have improved lighting, new stalls, showers and are now ADA compliant. 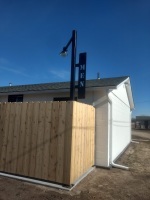 We would like to thank Cary for working with our volunteer demolition crew of Robert Anderson, Steve Mosher, Corey Nelson, Wayne Jeardoe and Gary Jeardoe Jr. to help keep our costs at a minimum. 2019 Cloud County Fair dates are July 9 – 13. 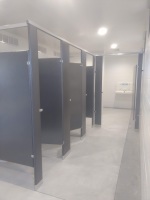 The east restrooms are available year round for all activities held at the fairgrounds, from livestock shows, rodeo functions, shooting sports to community events. 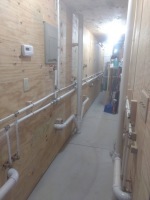 Pictures of the remodel can be seen at www.cloudcountyfair.org or on our facebook page Cloud County Fair.